From Toy to Tool: Cell Phones in Learning: Strengthen Vocabulary Learning with Gaming and Text Messaging! Strengthen Vocabulary Learning with Gaming and Text Messaging! The same group (Locamoda) that developed one of my favorite resources Wiffiti, has also developed Jumbli. Jumbli is a billboard (it really is in Times Square) with letters on it. Jumbli asks viewers (anyone can play it is free) to participate in a game of super-scrabble. 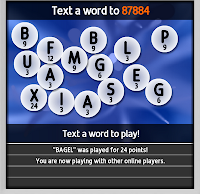 This is how it works; view the letters, and come up with the most "complex" word in the English language. Then send a text messagew with the word to 87884. Your word will instantly appear on the Jumbli billboard in Times Square, along with anyone else's words that have been added. Each word is given a difficulty score. Jumbli also works from anywhere in the world (they have an international number that you can text to). The letters are continously changing, so it allows students to continue to concentrate on developing new words. It currently does not seem to accept words in non-English languages. The game lasts a few minutes (great for an activity after a test or quiz to keep students learning but not bothering others). When the game is over (it starts and stops continiously) the winning words will appear. If the students do not know the words, it is an opportunity to learn the new words. I have also noticed that the Jumbli board is monitored (no offense language is posted), and it recognizes "pretend" words. If a students posts made up words or inapproprite words, they receive a text back that it will not be posted.